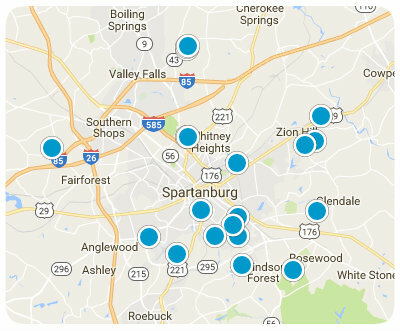 District 1 serves the communities of Landrum, Holly Springs, Campobello, Inman and all areas in between in Northern Spartanburg County. Its proximity to nearby Lake Bowen and beautiful scenery draw many visitors and is full of opportunity in not only entertainment, but housing, employment, and quality education as well. District 1 is a community large enough to provide all the modern entertainment and conveniences for residents to enjoy, but also small enough to keep its character and small town southern charm. Residents can enjoy many recreational activities, and is a water enthusiasts dream as District 1 is just minutes away form Lake Bowen. Although many active recreational activities are available such as golfing, biking, and horseback riding, District 1 also boasts a historic downtown, equipped with shopping and beautiful scenery. District 1 is a warm and welcoming community full of exciting attractions and entertainment, gorgeous scenery and a comforting place to call home. District one has eleven schools total, including six elementary, two middle schools, two high schools and a career center as well. District one prides themselves as one of the top academically performing school district in the state, based on the value of quality, student-centered education. Both Chapman High School and Landrum High School are award winning high schools that also are not only top in the county in academics but also athletics as well. For residents who want an excellent education and opportunities for their children, District 1 easily provides that and much more. Homes in District 1 offer gorgeous scenery and provide residents with an authentic urban feel. District 1 provides a wide variety of housing types in all price ranges. You can find anything from gorgeous mountain views with large acreage to small residential communities. No matter what you are looking for, District 1 can surely accommodate your real estate needs. Beautiful corner lot ready to build your dream home! Great small neighborhood just minutes from Landrum and Inman.